of a proposed building project. firewood why not have them milled into planks, dried and made into furniture. For most people this is the image they have of the inside of a tree, the end grain that is revealed once a tree is felled and cut into logs. However, this is the beauty that lies within that's revealed as the tree is milled. Not every fallen tree should become firewood, some deserve to live on. ready to take advantage of the first drying season. Advice on how to store and air-dry the timber. 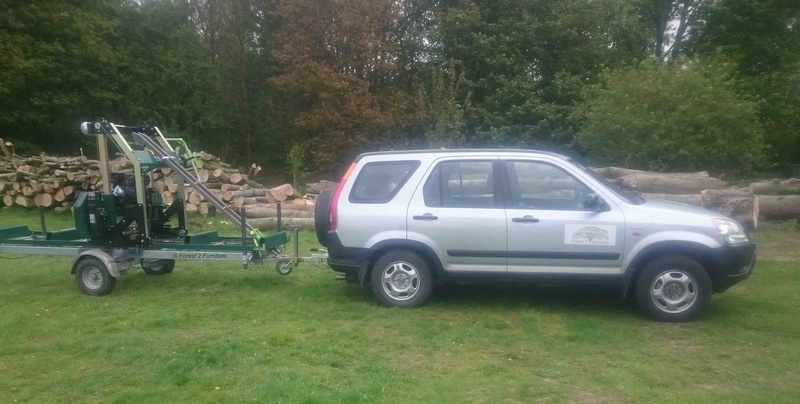 No need to go to the expense of having felled trees collected by lorry for milling off-site. to 30" in diameter and 10' long. will break it down with chainsaw mill first. Below are photos showing the process from fallen tree to planks sticked out for drying. 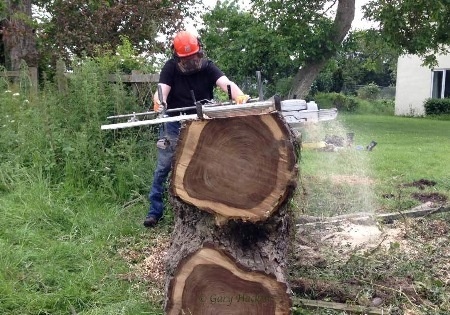 The tree shown is a Walnut tree that feel during Storm Doris in January 2017.
loaded onto the bandsaw mill. entrance hall of the house. The client used some of the larger planks later that year for work surfaces for their outside kitchen at the property. One of the problems many re-developers have when they demolish old industrial buildings to make way for new commercial and domestic dwellings is what to do with the huge roof timbers and trusses that so many buildings of the Victorian era were constructed with. Here at Forest 2 Furniture we think we have an ideal solution to this increasing problem. With our mobile bandsaw mill we are able to mill unusable roof trusses into manageable useful timber in situ at the building site. Because the timbers used for construction purposes in the Victorian era were cut from slow grown trees the timber we are able to produce is of a high standard making it ideal for various uses in the new properties.